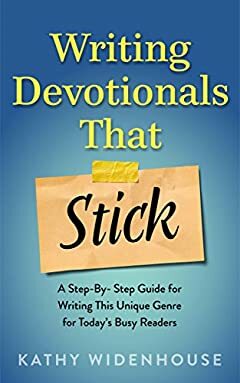 Writing Devotionals That Stick is a writing guide that shows step-by-step how to write devotionals (a unique genre in the faith-based market) in a way that stays with todayâ€™s busy, distracted readers. Leaders, entrepreneurs, students, moms, professionals, Christian writers (or those who want to be), and many others who want to share their experiences with God have learned to write sticky devotionals and meditations by using the principles found in this book. Itâ€™s a fun and easy-to-use guide packed with examples, writing tips, and â€œTry Thisâ€ exercises to help you put the steps into practice right away. Author Kathy Widenhouse shares these principles drawn from 15 years of her experience producing hundreds of devotionals for clients, leaders, and publishers.